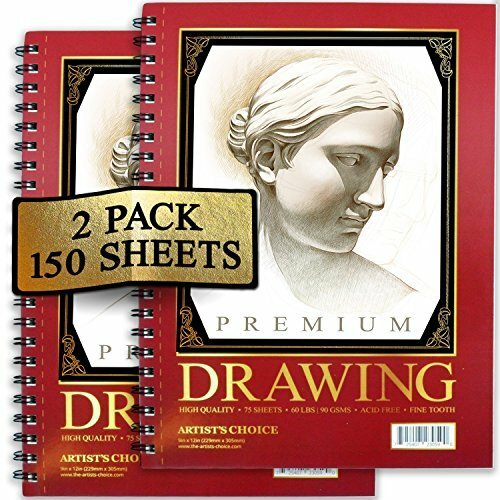 BUY ONE GET ONE FREE - 2 Pack of 75 Page Sketchpads. 50% More than the Competition! DURABLE SPIRALED BINDING - Each Page has a Perforated Edging for Easy Tearing. Ideal for Framing or Presenting! FULL 100% MANUFACTURER MONEY BACK GUARANTEE - If you find any flaw with this book, or any of our products, please contact our US Based Customer Support line and we'll offer you a free replacement or a full refund. If you have any questions about this product by Artist's Choice, contact us by completing and submitting the form below. If you are looking for a specif part number, please include it with your message.